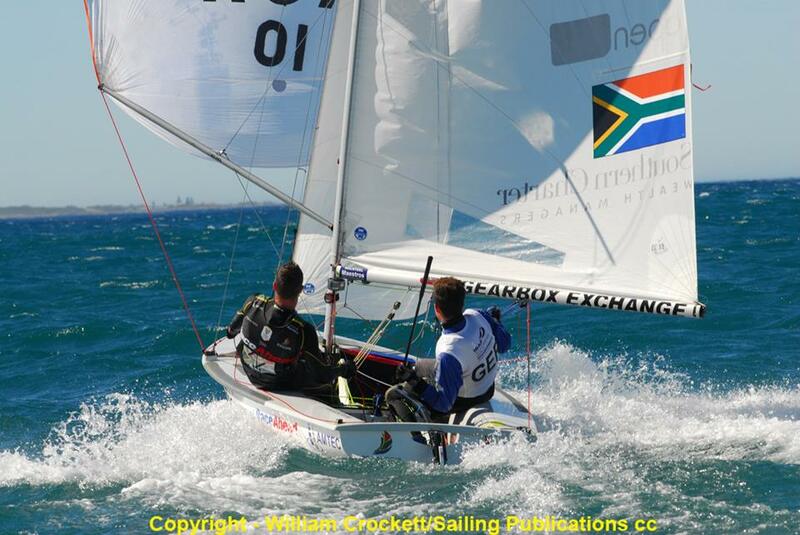 The opening day of racing at the first ever 470 African Championships in Cape Town was a test of sailors’ nerve in a frisky breeze. 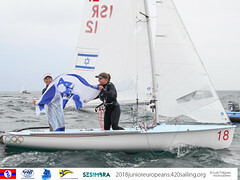 The race course was set half a mile from the shore, with the windy conditions serving up gusts of around 26 knots and an average breeze of 22 knots. 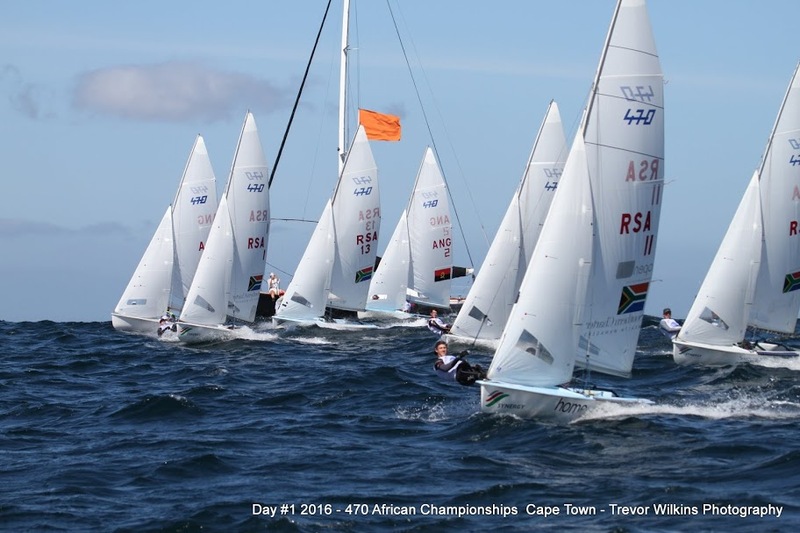 Featuring ten teams, the 470 African Championship is also the African Olympic Qualification Event with one place up for grabs on the starting line at the Rio 2016 Olympic Games. South Africa has already qualified to Rio, so by the end of the Championship it will be either Angola or Algeria claiming the place. 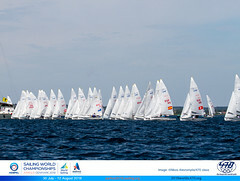 Racing got underway with a clean start at 1000 hours, but no let up in the wind saw only eight of the ten boats finish the race. 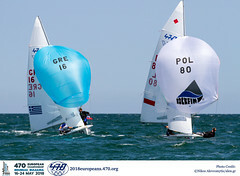 South Africa’s partnership of Sibusiso Sizatu/Alex Burger won the first race and were the day’s overall winners. 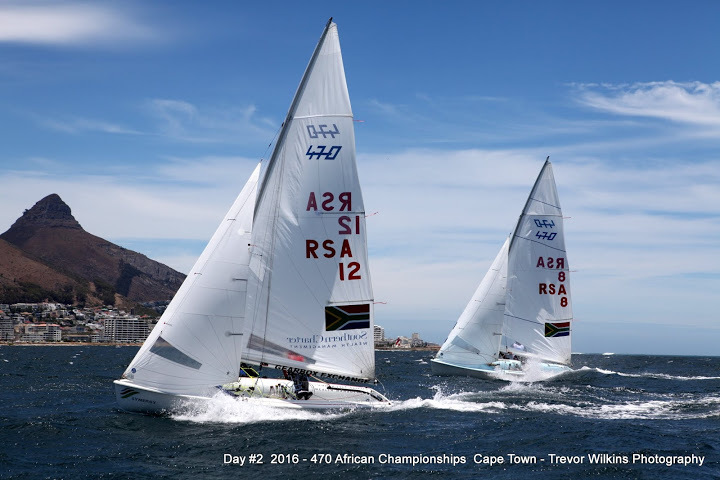 A clean start for race 2, and back on form were South Africa’s Olympic team of Asenathi Jim/Roger Hudson who seized the win. 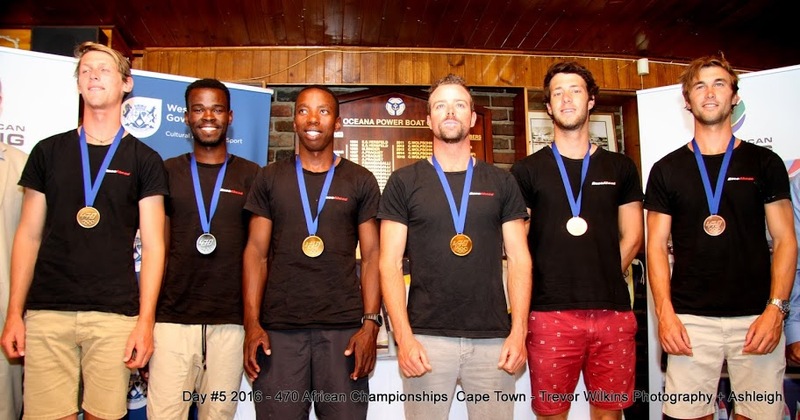 Once off the water, the yellow leader bits were awarded to the day’s overall winning team of Sibusiso Sizatu/Alex Burger (RSA), with Asenathi Jim/Roger Hudson (RSA) in second and and third to Brevan Thompson/Alexander Ham (RSA). 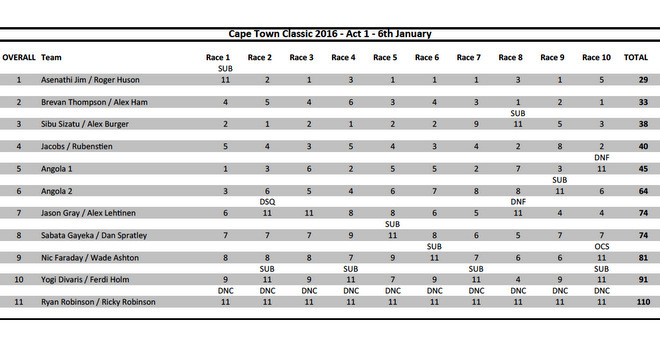 Three races are scheduled for Thursday 14 January. 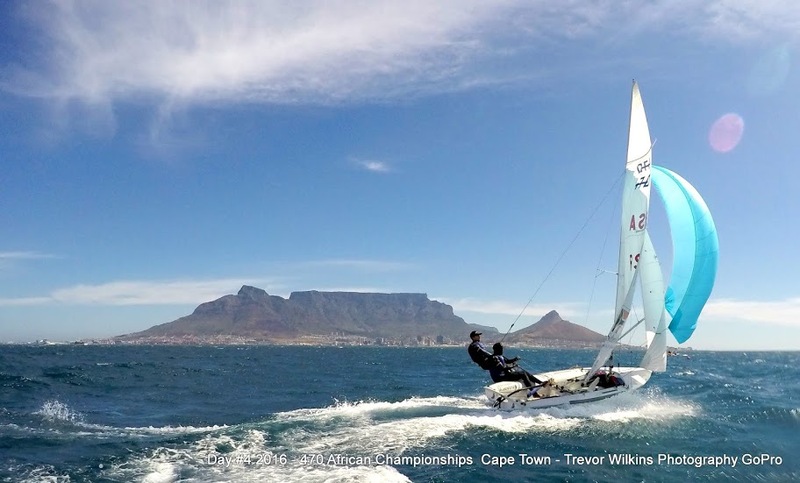 Not surprising to see some packed media boats on the water, including crew from SABC, the South African national television network; major newspaper, Cape Argus; and Forbes Africa magazine. 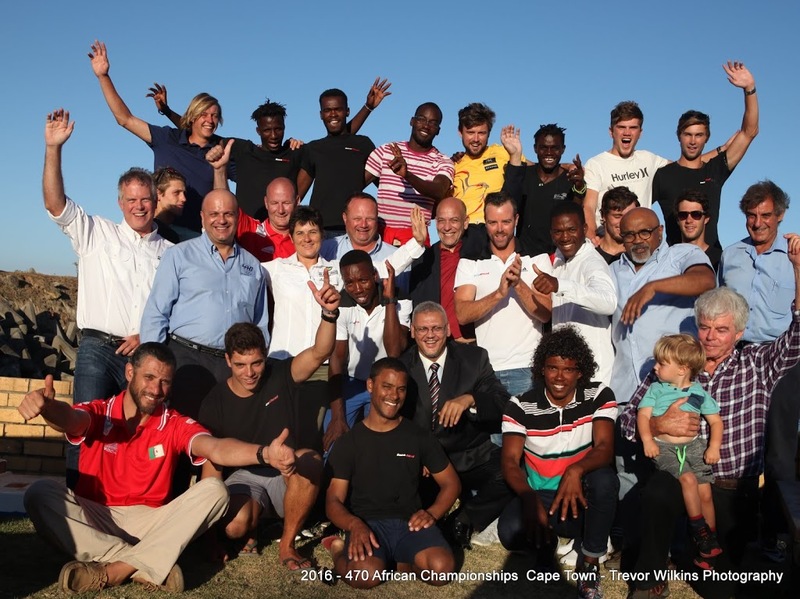 SABC aired footage of the racing as well interviews with Roger Hudson, Asenathi Jim and Dave Hudson of RaceAhead Foundation this evening, after prime time news.